I was quickly converted to bulk spices once I found the huge variety of Mennonite store, but my supply is running low. Last night I tried Leanne Ely's Garlic Lime Chicken. The recipe calls for a few powdered seasonings, like garlic and onion, that I don't keep on hand. 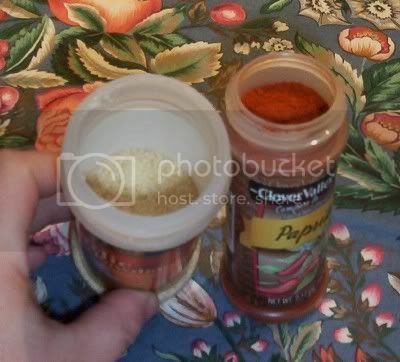 During my errands I popped in Big Lots and Dollar General, both of which offer spices for 48 cents a bottle. Now I know they're packed by weight, not volume, but I was surprised when the much larger Encore (Big Lots) bottle was already half empty--while the more compact Clover Valley jar (which holds .7 oz less) was full. I am curious about the origin of Clover Valley, though; the Encore Spices are repackaged from what I assume are outdated bottles and resold. How can Clover Valley offer the same price for fresh spices? Or does Encore also do the packing, but remain unlisted on the label? that looks like a wonderful recipe!